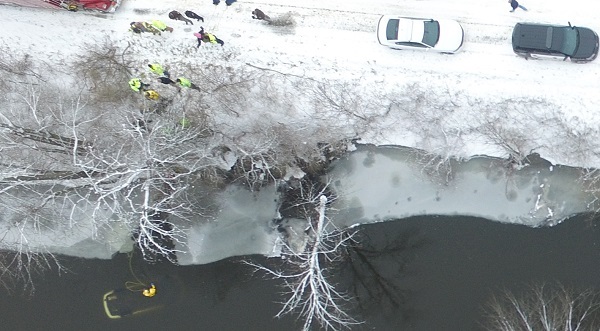 Two teenage girls and their father died Monday morning when their car left a road near Ligonier and plunged into the Elkhart River. Police were called just before 10 a-m. West Noble Schools were on a two-hour delay. Noble County Sheriff’s Office Deputy Brandon Chordas says the Toyota driven by 50-year-old J-J Reyes of Ligonier was southbound on County Road 700 West and entered a curve at Ball Road. Reyes lost control and the vehicle slid off the road into the ditch and then into the river. The vehicle was carried about 180 feet downstream before flipping over and submerging. Ligonier firefighters reached the vehicle and attached a tow cable which pulled the vehicle out. But Reyes and his daughters – 15-year-old Zulia and 13-year-old Valeria – were pronounced dead. Zulia was a sophomore at West Noble High School and Valeria was an eighth grader at West Noble Middle School. The schools made counselors available to talk to other students during the school day Monday.